This is my collection of handkerchiefs. I never used to love hankies or have a collection of them. Prior to going plastic-free, my purse always contained the tissue pocket pack. You know the ones I mean; the small collection of disposable tissues, wrapped up in plastic, that too would be disposed of in a bin. When I decided to swap my throw away plastic packaged tissues in favour of hankies, I was a little lost as to where I'd purchase them from. Did people still use hankies? The last time I used a hanky, wold have been in primary school. 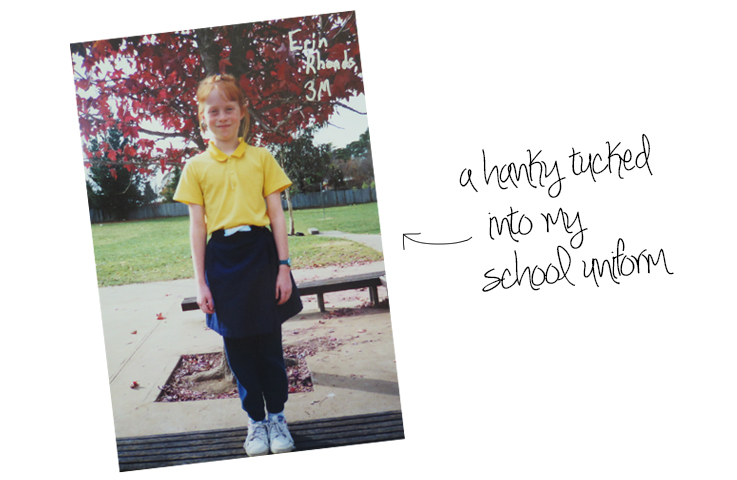 Yes, that's a hanky tucked into my school uniform. Most of my classmates had the plastic packaged tissue packets. I was jealous. Not many of the other kids had hankies. After a time, I wore my Mum down, swapping the hanky for disposable tissues. 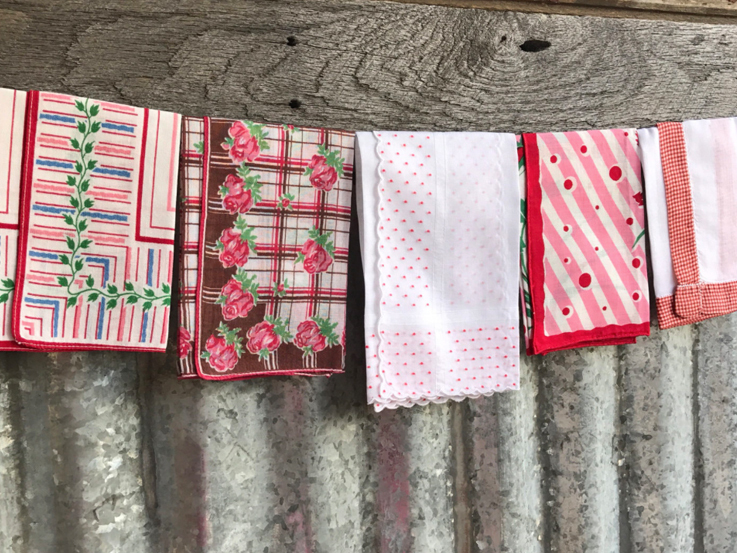 When I confessed to my Mum that I did not know where to buy hankies, she disclosed to having held onto the handkerchiefs her children rebelled against, and sent them my way. Plastic-free of course. Using hankies over tissues saves on not only plastic packaging, but also landfill waste. The thought of disposable tissues, full of illness laden bacteria hanging out in landfill makes me nervous. At least with hankies, the bacteria is killed when washed in hot water. It sometimes makes me wonder if there are superbugs, growing in our landfill...after all, nothing truly breaks down in landfill, especially when wrapped in plastic rubbish bags. Conspiracy theories aside, tissue boxes and plastic packaged tissue packets comprise of waste beyond just the tissue. The paper tissues are shipped to stores in boxes, with plastic tape, unloaded from pallets that were wrapped in plastic. For how many tissue boxes we go through, our stores would be disposing of bundles of plastic that we don't even see. Hankies are designed to be used over and over. Any holes can be repaired. At the end of their life, a hanky can be disposed of in a compost, breaking down between 3-6 months. A packet of hankies is a one time purchase, unlike tissues. As a new mum, I have found hankies to be one of the handiest and most versatile items to have on hand. If you are thinking of something useful for a parent to be, whether they are plastic-free, zero waste or neither of the two, put hankies on the gift idea list. I have yet to meet a parent that has not cried a tear, here and there. There are tears that come with a change of hormones following the birth. The tears from exhaustion. Happy tears. My baby is crying and it makes me cry, tears. My baby is growing too quickly tears. Having a hanky close by to mop up those tears is essential. Ah, leaking breasts. It could be a light leak or a heavy surge, either way most breastfeeding mums will need breast pads. On the odd occasion I've found myself out of my reusable cloth breast pads. They might be damp on the clothes line. I might find them unexpectedly soaked through, because Bub slept a little longer and I forgot to express. Rather than wear damp breast pads or risk going without, the humble hanky serves well as a functional temporary breast pad. 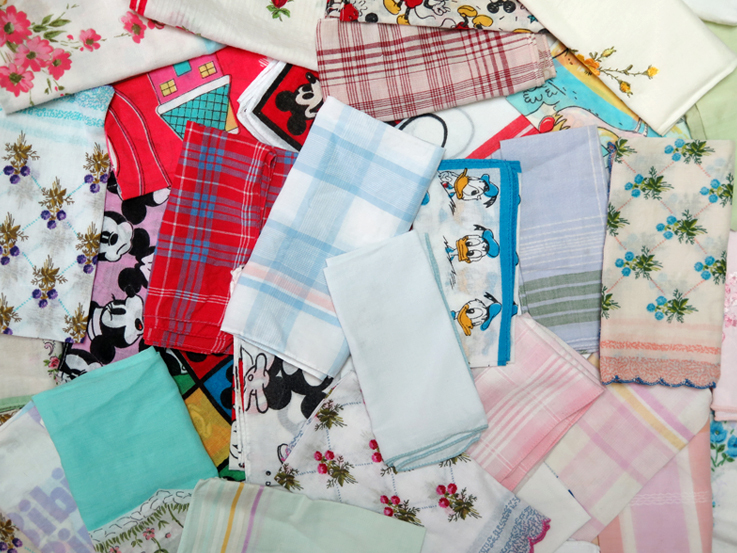 Etsy have a huge variety of second hand handkerchiefs, like the ones in the photo above. We have cloths for our baby's dribbles and posits. Sometimes they are not always within reach. You can never predict when a baby is going to do a sneaky posit. It could be directly after a feed or thirty minutes later. With a hanky in my pocket, I can clean up the dribble and posits quickly. I ventured to a cafe on my own with Tifl for the first time. We settled in. I ordered a cup of herbal tea and my fave vegan donut. Just as I was half way through my sweet donut, ole' mate decided that the cafe was not his vibe, showing it loudly. I wrapped up my half eaten donut in a clean hanky and we headed home. Who knew hankies would be handy for food transportation and saving food from going to waste. Win! These organic cotton hankies, are a good option for those, that don't find gifting a second hand hanky appealing. Interacting with my baby is important for his growth and development. Plus, it's fun for me. I like to grab a hanky, especially one with shapes, and play peak-a-boo or let him stare at the patterns. Who needs fancy black and white books. My old mickey mouse hankies keep him amused. I'm imagine there are many other ways hankies are useful to new parents, beyond their intended use. If you know of any more, I'd love to hear about them in the comments below. I forgot to mention in my last blog post, the reply received from Elevit. Er, whose Elevit? Isn't that a pregnancy multivitamin? Remember last year when I questioned who was responsible for making and reducing rubbish? Here is the blog post. For those who don't want to click through, in a nutshell, I was challenging why zero wasters kept all their rubbish in a jar, when instead we should push the responsibility back onto the businesses making the packaging, we spend so much of our time avoiding. Basically, I felt like so much obligation for avoiding waste fell onto the consumers shoulders, when really it should be both. Consumers can only avoid so much, and if we are not speaking up, how can these big corporations know that we want change? So I decided to start speaking up, sending back rubbish that I can't avoid and ask for smarter decisions on product design. Tagging these companies in a hashtag won't always work. In the blog post, Rubbish - Who Is Responsible For Making It And Reducing It? I took aim at Elevit and their packaging. During my pregnancy, I chose to take a multivitamin that came with extra packaging. Packaging that I know could be smarter. So I sent it back, with a letter and a suggestion. I am sending part of your packaging back, as I could not find a way to dispose of it, other than to landfill. As a consumer, this should not be my full responsibility to figure out if packaging like your blister packs can be recycled. I believe you could do better with your packaging. It is a tad ironic that your product is to help mothers grow a healthy baby, yet your packaging is not healthy for the planet. I have included a sample of how you could make a simple swap from the plastic and aluminium blister pack to full aluminium. This would make your pill packets 100% recyclable. The swap would keep all the blister packs out of landfill, reduce resources, ensuring the next generation you are helping grow will not have to deal with our rubbish. Plastic production and its use can be harmful, not to mention landfills are expanding across the world due to poor packaging designs like this. I hope you will consider switching to full aluminium blister packs. 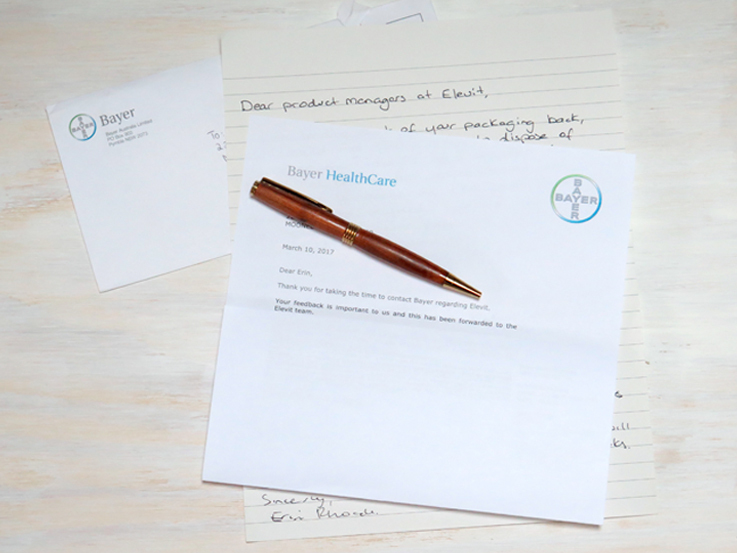 Thank you for taking the time to contact Bayer regarding Elevit. Your feedback is important to us and this has been forwarded to the Elevit team. Should you like to discuss this further, please call 1800 023 884 (Mon-Fri: 9am-4pm. Sydney time. Please choose option 1, then option 2). Please quote reference #AU170021xx. Alternatively, we are able to contact you if you could provide us with your telephone number. We look forward to hearing from you soon. Shortly after my original letter was sent, I found myself in a conversation with a someone who used to be involved with large corporations like Bayer. Not knowing my life, that I wrote a blog on reducing waste or had sent my rubbish with a letter back to a multinational company, did he tell me that if a handful of written letters are sent on a particular issue, that they have to be presented at the board of director meetings. So who knows, my letter could have made it to a director. Either way, the effort was not done in vain. A seed has been planted somewhere at Bayer. I'm planning to delve into the subject of speaking up and activism this year, so look out for more on this subject. It seems to be a subject largely ignored. And I plan to research the legitimacy on consumer based issues making it to board of director meetings. In the meantime, I'd would be interested to hear of stories on when you have spoken up about an issue. Was it met with any reply? How did it make you feel? Don't worry, this is not a post about Adele. Not that an Adele themed blogpost wouldn't be awesome. I'm simply stealing the words for the title, as they are the most accurate description on how I feel right now. It's been six weeks since the birth my son, yet I feel like it's been six billion light years. Life before his birth feels far, far away. 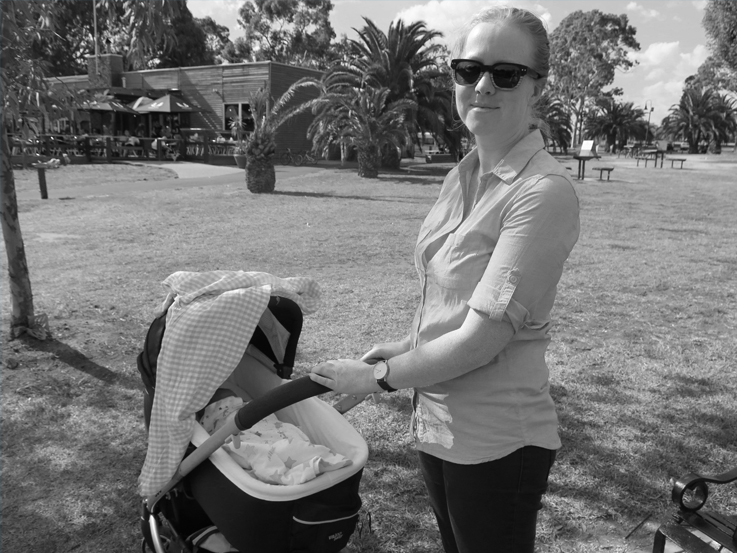 But while I'm navigating the haze of being a new parent, much has been happening on the plastic bag campaign here in Australia. Popular news TV show The Project have joined forces with Clean Up Australia, calling on the final three states without plastic ban policies, NSW, Victoria and WA, to #banthebag. An online petition was set up and sent out, amassing over 100,000 signatures in under a week. Technically, State governments don't view online petitions like these with much legitimacy. Even though it's not a legit petition, the call to arms has helped keep the conversation on plastic pollution afloat. The Project and Clean Up Australia also stressed the importance of contacting local MPs and the three State Premiers via phone, letter and email. This has been particularly essential, with the upcoming report from the inquiry into banning plastic bags in Victoria being released on the 25th of May. Fingers crossed that The Project and Clean Up Australia's campaign is the final push needed to get my state to act. Back at home, there is other news. The Builder bought a house. I wrote a post back at the end of last year, about how we would be staying in our present home and not moving. We even ripped up the old garden to grow vegetables. The best laid plans of mice and men, often go awry, right? It's an old house, built at the turn of the century, and it requires a lot of work. I'm not sure what possessed my husband to decided the move. I did have a rather nasty fall down our stairs while five months pregnant (baby was fine, I was bruised black and blue) and I wonder if that was the catalyst to look for a single story home. Our aim with the renovation, is to reduce the need for any heating and cooling. And the Builder is already salvaging materials to build with. The grand vegetable garden we were to plant this autumn is now being taken over with weeds. We figured there would be no point putting effort into growing vegetables, if we are going to sell the house half way through the winter season. I also wrote in that same blog post that we would be a one car family. That also went out the window and we are now the proud owners of a secondhand Camry Hybrid. Turns out the Builder's ute did not have the needed contraptions to fit a baby capsule. Getting around the city without a car is fine, and i've been doing it for the past six weeks. However, if we wanted to drive up to see my parents or go on any family adventures outside the city, then we would have been stuck. Australia's versions of The War on Waste TV show is debuting May 16th on the ABC. I worked behind the scenes on the show with the producers. I am super excited to watch it and see where conversations go on the topic of waste in this country. I'm SO excited that I decided to do a giveaway the week it airs. If you live in Australia, watch out for the giveaway on my Instagram and Facebook. By the way, our bub will be referred to as Tif/Tifl on the blog. This is his actual nickname. During pregnancy we called the bump Tifl, an Arabic word for baby. The Builder is Aussie Lebanese, hence the Arabic. Anyway, the nickname stuck and we continue to call him Tif or Tifl. Finally, thank you for all the well wishes over the last six weeks. My inbox, instagram, facebook and even mailbox was inundated with sweet words. Your messages made me smile. It's nice to be back here, from the other side.